The general buzz that accompanied the debut season of Documentary Now!—IFC’s cult series of hyper-specific documentary parodies from a team of SNL alums including Seth Meyers, Bill Hader, Fred Armisen and John Mulaney—was that, on paper, this should be one of the most niche and inaccessible shows ever to hit TV. Instead, critics said, it was an absolute blast whether you’d seen the source documentary or not. With this proof-of-concept thoroughly under its belt, the third season of Documentary Now! is able to gleefully dive into even more obscure territory. For Alex Buono and Rhys Thomas, the directors who bring each episode to life, this level of detailed parody is more creatively freeing than it is constrictive. “Our take has always been, even from season one: these need to stand alone. If you’ve seen the source documentary, it will be even more meaningful, but it’s still going to be fun alone,” says Buono. Take Co-op, season three’s parody of the documentary about Stephen Sondheim’s musical Company. “Original Cast Album: Company is very well-known and beloved among a very narrow niche of Broadway folks,” Buono says. “It’s very hard to find. It’s not on Blu-ray, it’s not on DVD, it’s not on iTunes or Netflix.” In doubling down on the—deceptively difficult to parody—elements of a Sondheim musical, and musical theatre in general, they made an episode where that didn’t matter. But that’s not the only way Documentary Now! is branching out this season, which parodies films like Wild Wild Country and A League of Ordinary Gentlemen. It also introduces an all-star lineup of fresh blood including Owen Wilson, Cate Blanchett, Michael Keaton and Michael C. Hall. “It was a scheduling thing, ultimately,” says Thomas, who is also credited as one of the show’s co-creators. “Bill [Hader] was starting to work on Barry… and we all agreed to the decision that we could find a new path, and to really embrace the anthological nature of the series. 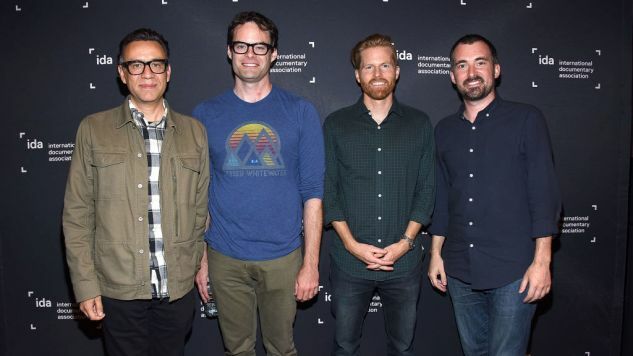 Ultimately, once we really started digging into that idea, you realize the world sort of opens up in terms of the episodes we can do.” Without having to find documentaries that would make for a good two-hander with Armisen and Hader, the show can parody female-driven films, ensemble pieces, and shake up the audience’s expectations of what the show can do. Playing into and then subverting expectations, it turns out, is the key to a successful parody in Thomas and Buono’s eyes. “Alex and I worked together for years at SNL,” says Thomas, “and often a lot of our work would require that we take on a ‘type.’ We’d do genre pieces, where we’d be doing a fake movie trailer that was supposed to represent a whole world of films.” The trick is to quickly be honest with yourself as to what floats to the top of your brain when you think of a specific documentary or a genre of documentary. What are the highlights? Filtering this will allow you to ground your audience in the first few minutes of an episode and get them familiar with the tone. From there, you can mess with that narrative as you please.